There are some more recent stories in the forum. I picked up Free Words at Ground, a coffeehouse in Jersey City, N.J. It's in my apartment in Jersey City as I type this. I'm trying to figure out where it should go next. I've been holding on to five FREEWORDS for a month now, always too lazy or busy to do anything with them. So on Friday I finally decided to go to the local mall and hide one there. The mall is located in Markham, Ontario. It's called the Markvile Mall. and I hid it in the Coles bookstore. It could be the BookSmith. .... i forgot. One or the other, i just forgot the name. There should only be one bookstore in there. I might put 2 in the Chapters near my area soon. I came to Freewords.org via opsound.org. reading the various comments by people distributing the book and A Barkers story of keeping a copy untill it is worth something made me wonder if i might find one on e-bay - i mean they have almost everything for sale there. i'll keep looking though - eventually somone will want to attatch dollar signs to it! I just stumbled upon this website by pure coincidence. I had to know how a pink book could have ended up among leather bound, dust collecting books.Now I'm filled with a feeling of excitement every time I enter a bookshop. It's like I can see past the facada of the store. It's like the bookstore is hiding a secret that only I know of. I had one of the best days ever! 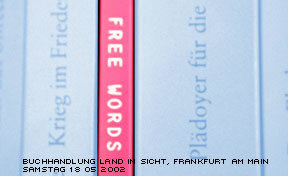 I actually found not only one, but THREE Free Words books in the Housing Works Used Bookstore and Cafe in Soho, NY. Forgive me, but I took two myself! I will pass it along to a friend maybe. Anyway, thank you so much for doing this cool project! And spread the free words! I placed Free Words over a period of time this summer at 4 bookstores in the Kansas City area. As far as I know they've all been found. They were at Half Price Books in Overland Park, KS; Barnes and Nobel on the Plaza, Kansas City, MO; Spivey's Bookstore in Kansas City, MO; and Bloomsday Books, Kansas City, MO. i was so excited when those slim pink volumes finally arrived in my possession. i had been planning my various placement locations for quite sometime, and immedately placed a copy on my own bookshelf. :) my first attempt at a public placement was at the main branch of the chicago public library - harold washington, downtown in the loop. 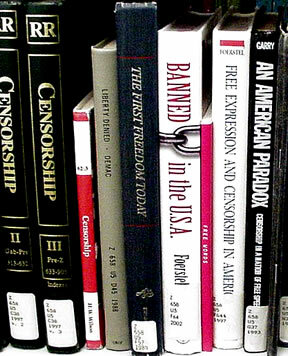 i had decided that i would place FREEWORDS next to abby hoffman's STEAL THIS BOOK, but the only copies in circulation were at a branch up north, at the sulzer regional library. lucky for me, that is a few blocks from where i work. so a few days later, i went to the library with a co-worker, to try again. 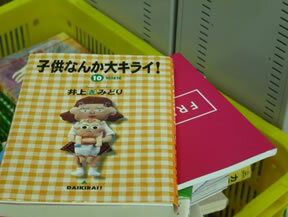 i asked at the info desk for the location of STEAL THIS BOOK, and discovered it was checked out. so i put my name on the list to be notified upon it's return, and then went and placed FREEWORDS where STEAL THIS BOOK would have been. (i think it is in the activism section) i figured this would be good way for me to come back and monitor the status of the placement. i put a sticker on the book drop box outside the library, and that lasted a few weeks before it was removed... i have yet to go back and check to see if freewords has moved from the shelf (they never called to notify me of the return of STEAL THIS BOOK.) the second placement i made was at the printer's row book fair. i perused the table for powell's bookstore and then casually slid the volume onto one of their crowded shelves. no one seemed to notice. i was not as particular about this placement as there seemed to be minimal organization to the books on display. and besides, it was hot and crowded, and people were getting shovey! i put the sticker on a green mailbox, that was close to the tent. 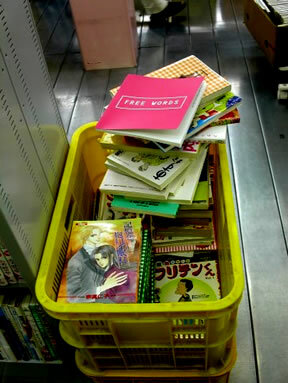 i have no idea if anyone picked it up, but maybe FREEWORDS made it into the store stock when they packed up at the end of the day. i am very curious...two more placements to go! I saw the sticker for Free words on the tissue dispenser in my highschool bathroom. 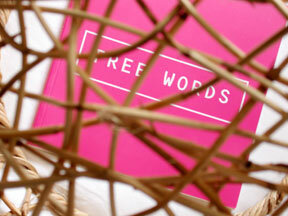 i am on the nervousness.org's yahoo gourp mailing list and i always have been interested in getting a 'free words'. however i didnt think it would make it to vancouver b.c. 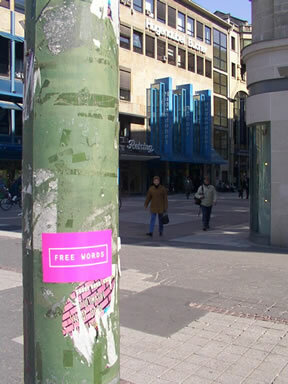 until one day i got an email topic with 'free words' and found out there was a distritbutor in vancouver i asked where is it around and it was somewhere i dont normally visit. so when a friend said he is going around there i asked him to check for me and he did find it! but.. he left it in the purse of a friend that he met over the internet which was only staying in vancouver for a few more days and would go back to victoria then taiwan for two months! i didnt think i would get to see it for a long long time if at all and i constantly bugged him to meet her again. but he said she is leaving already and with disappointment i would have to wait for her to mail it. however all of a sudden a few days later he said she was still in vancouver (weird) and he is meeting her so i just got it ! and am v. happy! Well, I have placed 2 of the books that I got. Both of them went into my local Borders store in Tallahassee, FL. I found a section with the heading "Word Play" and couldn't resist putting one there. I put the other one in the Gay and Lesbian Literature section next to Angels in America. I figured the bright pink cover was sure to get noticed there. I didn't have the opportunity to stick around and watch to make sure staff didn't just take them away. With my other ones, I think I'm going to camp out in Barnes and Noble and watch to see who picks them up. It was great fun placing them. I hope to take pictures next time as well.